In his latest book, historian Elliott West offers a revealing analysis of a time in which the American nation was transformed. When Lewis and Clark met them in September 1805, the Nez Perces lived in villages in what are now the states of Idaho, Washington and Oregon. They were protected by mountain ranges and sustained by abundant salmon, game and plant life. Fur traders followed, and 30 years later, the first Christian missionaries arrived. Despite treaties that delineated the Nez Perce reservation, the discovery of gold in 1860 brought a flood of white immigrants into Nez Perce lands. 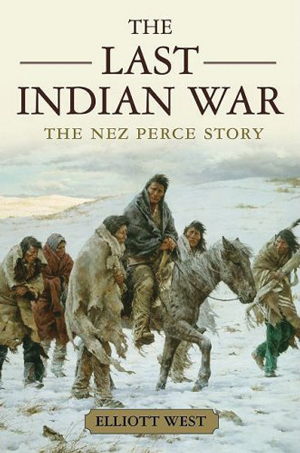 The war of 1877 ended in the defeat of the Nez Perces. For nearly four months in 1877, the Nez Perces fled their homeland on a journey of 1,500 miles. Their warriors held off the American military, besting them in every encounter until the last battle. The Nez Perces were less than two days’ ride from Canada when they were defeated at the battle and siege of Bear’s Paw Mountains in Montana. The Nez Perces were relocated to Indian Territory in Oklahoma. It was nearly a decade before most Nez Perces were permitted to return to their home area in Idaho or to a reservation in Washington State.